For those who are interested in flying Bugattis, I recently discovered a (at least for me) new Airplane that used Bugatti engines. It is a Dorand - Bugatti from 1915, drawings of which I recently found on the Internet. It is a triple winged, double engined bomber machine. It has two of the 8-cylinder Bugatti airplane engines (see the Bugatti Revue), on the front view of the plane it can be easily seen that the propellor axle is offset from the engine-due to the reduction gearing. The fuselage is actually very slender, and was designed by the Polytechnician, founder and director of the "Section Technique de l'Aéronautique (STAé)", based at les Invalides in Paris, colonel of the Génie Emile Dorand. He obtained in 1915 from a rich astronomer / patriot Salet an important sum of 25 000 francs, for the study of a water-plane capable of fighting the German submarines, which were responsible of destroying a lot of Allied ships. Dorand confies this sum and the project to Alphonse Tellier. Duhamel also puts himself to the job. During summer of 1915, the shops of Tellier begin the construction of the Dorand airplane, using Bugatti engines of 200 HP, to be piloted by Labouchère. Unluckily, the engine is a disaster and condemns the project. The situation puts Tellier back into aviation. Source: pgts.free.fr/etudegh, more specific in the story about the Hydravions de Alphonse Tellier, author Gérard Hartmann. The site is absolutely a beauty for anyone interested in early French aviation (and who can read French). Source of the pictures: Le Trait d'Union. 1933 Breguet - Dorand Helicopter, unknown Bugatti 250HP engine, maybe Breguet - Bugatti? *? 1918 LUSAGH 21, 1 King - Bugatti engine *? 1923 Breguet XXII, 2 16 cyl. Breguet - Bugatti engines *? The * indicates the planes that have probably flown. I have heard from various sources, that a Parts advert which has been on my Parts for Sale page, was probably a ripoff. Various people either lost contact while communicating about parts they were willing to buy, and much more serious, people who sent substantial amounts of money for parts, and never received anything. Unless the guy has died meanwhile, and nobody checked his computer, this is probably from somebody who was only interested in getting money very easily. Reportedly he was well informed on the subject of Bugattis, and the parts and prices. He used the E-mail address partz101@themail.com in the advert, while communications were also made to the following address: wendell2@themail.com. I want to ask if anybody has a fysical address of this guy where money was sent or otherwise, so we can track him down. Those who sent money, I can only suggest to report this to the police. In general, I cannot possibly check people who are offering anything on my pages, I´m afraid. When in doubt, it would be wise to ask for some physical proof that the advert is a honest transaction. When in doubt, of course you can ask me if this person is somebody with whom I have had more communications, or if it is somebody unknown. I can only hope that this will not occurr again, though it probably will. It may even be that the same person will show up in the future, with an entirely different name. On September 15, 2002, In Dorlisheim, the small village near Molsheim in French Alsace, where at his time Ettore Bugatti was building his legendary cars, the foundation brick was laid for the Atelier, in which the Bugatti 16.4 Veyron will be assembled by the end of 2003. More than 400 guests gathered at the building site between Dorlisheim and Molsheim. Among them were the mayors of both communities, Mr. Laurent Furst (Molsheim) and Mr. Gilbert Roth (Dorlisheim), as well as Dr. Folker Weißgerber, Member of the Board of the Volkswagen Corporation responsible for production and logistics, and a delegation from Wolfsburg representing the employees‘ union. On this historic site overshadowed by the fabulous Château Saint Jean and a stone’s throw away from the old factory sheds, the president of Bugatti Automobiles S.A.S., Dr. Karl-Heinz Neumann, laid the traditional first brick for the new building. 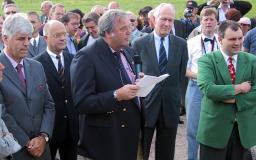 In his address he emphasized the great importance of Bugatti’s technical heritage for the trademark and paid hommage to the enthusiastic owners of classic Bugatti automobiles organized in Bugatti Clubs all over the world for their engagement in keeping alive the myth of the brand name up to the present time. Apart from assembling the Bugatti 16.4 Veyron and after the renovation of the Remise and the Orangerie buildings, space will be made available for further automotive activities, “which surely will make headlines. From now on, visions turn into reality”, according to Neumann. The brick-laying ceremony framed by the annual Bugatti Festival at the occasion of Ettore Bugatti’s birhday on September 15, which brings together hundreds of Bugatti fans and their historic vehicles in Molsheim, demonstrated the further progress of the rebirth of the Bugatti brand name and marks the next step in the creation of the high performance sports car, the 16.4 Veyron. The first prototype of the Bugatti Veyron 16.4 is ready. Trial runs have begun. On the trial grounds of the Volkswagen corporation in Ehra-Lessien the trial runs of the Bugatti Veyron 16.4 have begun. After termination of the testing stand trials, the real testing phase begins, where the vehicle as a whole, but in particular the drive train, is tuned in detail. The innovative double clutch transmission, which has to bring the enormous power of the 16-cylinder engine of 1250 Nm on the road with total reliability, deserves a very specific attention. In the following weeks the Bugatti Veyron 16.4 will be driven over far more than 100.000 km and will have to prove its qualities under enduring trials. The Georgian designer designed the above Bugatti for the Russian firm A-level, who is currently making it, the car will be shown soon on international auto-shows. Bad luck for those interested: The sole model they will make is already sold! 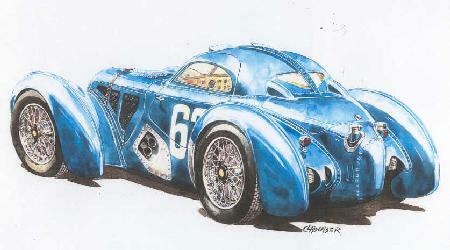 More about this, and other Tsikolia designs in the last issue of the Bugatti revue. 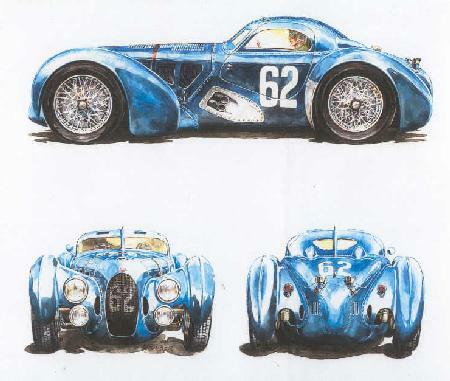 Those who were at Retromobile may have seen these designs by Pur Sang Argentina already. It is not yet known if this design, which they call the Type 41 Sport Carrera, ever will be executed, but I found them interesting enough to show it here. The designs were made by Luis Huber, and I find them quite successfull. The car is most obviously formed around a T41 engine. Once I have more information from Jorge Anadón about his plans with this car, I´ll let you know. Click on any picture for an enlargement. Recently I was (well, my computer) infected again by a Virus, one of those who sends itself to everyone in your address book (over 600 people in my case). I´m very sorry for this, especially, because in order to disinfect, I had to connect to the internet to download a program from www.norton.com, and in that instant the Virus sent itself for the 2nd time. I sincerely hope that I have not caused any of you too big a problem. Una Curva Cieca, a Softcover about Achille Varzi, Man of Ice, will be translated from Itailan into English. Approx. price: 20 euro. Michelin succeeded in developing a new tyre with the same high prestation level as the new Bugatti Veyron, thanks to the PAX System technology. It is the first tyre that is approved for speeds of over 400kmh, with which the Bugatti will be delivered standard. The prototype, the PAX Bugatti Veyron has been shown during the past months at various international car exhibitions. PAX System gives the possibility to improve the performance of the tyre within the same dimensions, so more safety at high speeds, or the possibility to reduce the tyre dimensions for the same performance, so eg. there is more space for intake of air at the front of the car, or to mount bigger brake discs, big enough to brake at 400 kmh and a mass of 1.75 tons. Asymmetric tyres for high performance generally have a stiffer shoulder on the outside, which enhances road holding. The inner shoulder is more flexible which enhances comfort. In a PAX system tyre also the hight of both shoulders is deifferent, the inner shoulder being lower and stiffer than the outside one. This gives the possibility with these tyres to play more with balance stiffness / comfort, giving an optimum balance between road holding and comfort for relatively heavy and extremely fast cars. The profile of the new superfast Michelin tyre is directly inspired by Bugatti´s personality and design. It is developed in close cooperation between Michelin engineers and Bugatti designers. A broad central rib accentuates the asymmetric profile. The profile on the inside expresses comfort and pleasure, while the profile on the outside links to sportivity and safety. According to latest reports by French monthly Sport-Auto (No 483, April 2002, page 24) under the title "Retour sur terre", the development of the châssis of the Veyron 16/4 appears to be rather problematic. A self-limitation of the maximum speed to "just" 350 km/h (instead of the previously anticipated 406 km/h) would be under consideration! It is also pointed out that, although the "Italian" production of Bugatti has been carefully occulted by VW, an EB110 S has indeed been purchased in order to closely study the reactions of a super-potent 4wd car! Additionally, Dallara of Italy has been contacted for the realisation of the carbon-fibre châssis. Interestingly, in the same issue, there is an article with the first driving impressions of the "descendant" of the EB110 (the rwd, 365 km/h Edonis), being currently developed in Modena, by the same people of the "Italian" Bugatti. For another round of (entousiastic) comments after the drive of the Edonis see also the April, 3 2002 issue of English weekly Autocar, where it is compared with the Lamborghini Murcielago and the Pagani Zonda C12 S.
Bugatti will participate at the Paris Auto Salon showing the experimental car 16.4 Veyron, soon to be produced in series, and a chassis of the legendary 47 model equipped with an original 16-cylinder Bugatti engine (built in 1930). In this way Bugatti wishes to emphasize the traditional importance of the Paris Salon for the brand name. The Paris Auto Salon is one of the top 5 exhibitions in the world of automobiles and takes place every two years alternating with the Frankfurt International Automobile Exhibition. This year, the Paris Salon opens its doors on September 28, 2002. Until October 13, the exhibition is open between 10 a.m. and 10 p.m. Interested parties will find the presentation of the 16.4 Veyron and the model 47 chassis in Hall 4, Booth 215. Rembrandt Bugatti deer sculpture on auction in London, King Street. Christie´s auction. At least 37 Bugattis will be competing here, ranging from T13, to T35 and even T53 to T57SC! As generally known the Dauer firm in Germany (same firm that built the Porsche 962 street cars) has taken over all the spares inventory from the Campogalliano factory, and have set about using components of unfinished EB110s to produce a run of new EB110SS cars called Dauer EB110s. They've uprated the engines and tyre specs, and the bodywork is now completely carbon-fibre for lightness and rigidity. One of the cars is unpainted--just clearcoated over the bare carbon fibre weave--which looks very striking indeed. 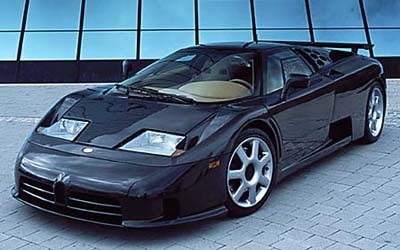 They'll only be building 5 of these new EB110s. Dauer racing is also the only certified servicer for the remaining Bugattis. The dotted-ellipse badges now say "Dauer EB110" on them...but the "EB" monograms are still there as is the T251-style horseshoe grille- in-a-grille, so the identity is still clear. Also the interior and lots of other details are still the same. Checking out the EB110. The wheels are magnesium and are manufactured by BBS. Michelin Pilot SX MXX3 tyres 245/40 R18*9J in front and 325/30 R18*12J in rear. Jochen Dauer told us: "A classic recipe is: if you can't make a better engine, then make the car lighter". So he did. Instead of having the bodywork in aluminum as the original car had been, he produced them in carbon fibre. That resulted in a 200 kg lighter car which did wonders to such an already light car. The interior is very luxurious (rarely seen in supersportscars of this caliber). It has all the amenities you wouldn't excpect in a car that outruns the Ferrari F40 and F50): full leather, wood, AC and a high quallity stereo. The Dauer EB110 will cost you 480 000 USD. Go to the Dauer site to see more! A novel about the winner of the first Grand Prix of Monaco: Capt Grover Williams: in 1929, and of course in a Bugatti! In the flamboyant twenties, Englishman William Grover-Williams and Frenchman Robert Benoist are fierce rivals racing their elegant Bugattis on the glittering European race circuits. Not only is the World Championship in their sights, but they have both fallen for the sensuous charms of the extravagantly beautiful Eve Aubicq. But when war breaks out, both are signed up by Special Operations Executive for missions behind enemy lines in France, one of which includes investigating rumours of the manufacture of the lethal gas Zyklon B and how it is being used by the Germans. In a series of daring sabotages and assassinations, they cause havoc to the Germans, but finally their cover is blown and they are captured and tortured. Based on a true story of British covert activity and the French resistance during the second world war, this is a gripping novel of heroism, self-sacrifice, love and betrayal. Australia Post is celebrating the sport of motor racing in Australia with a special stamp issue. 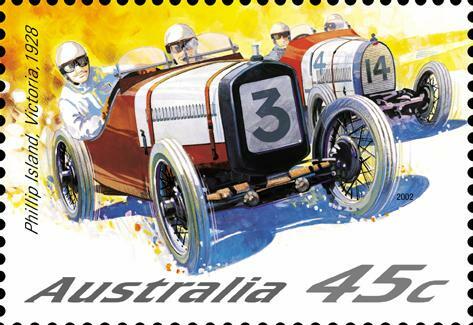 These stamps celebrate some of the great cars, drivers and events of Australian motor racing history. The designs are based on illustrations by well-known Melbourne-based motor artist Fred Briggs. These stamps will be featured on Australia Post's Stamp site (www.auspost.com.au/stamps) in late February. The site will include a motor racing links section. 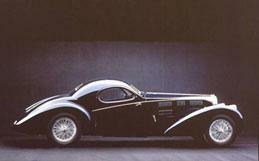 Today the Bugatti page exists 7 year, at the time it was the only site on Bugattis available. 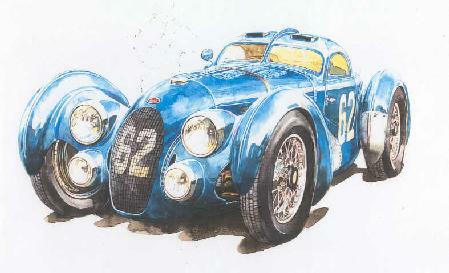 The next one was Jacob Munkhammar´s site, and now a tremendous number of sites on Bugatti are available worldwide! Negative side of this long time is a steadily growing site that the space is too small, and I have to escape to other locations (with adverts on the page, hope to get rid of those!). Does anybody know of a cheap way to host 100 to 150MB, with no limits to traffic? Well, we´ll survive anyway, I guess! Have a drink on us! Vive La Marque! Now for the CONTEST. It was a great succes, with 24 people sending me all kinds of art! Read all about it by clicking above. They will receive their prizes soon! At a Christie´s auction on December 4, 2001. A 1927 T37 was sold for 152,250 pounds. 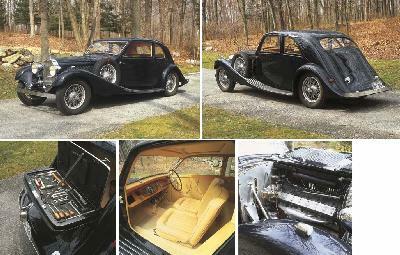 The car formerly belonged to Count Johnny Lurani and Alec Ulmann. Really a quite handsome car! Click on the picture to enlarge! Exceptional Motor Cars and Automobilia including The James Allington Collection At the Jack Barclay Showroom, Nine ElmsLondon. Various items, drawings and some parts (headlights, T49 wheels, steering wheel) on auction. In the Paris Palais des congess will be auctioned in a Poulain Le Fur auction the T57 #57 524 coupé, replica body from an original drawing by Gangloff, 1937. C'est une Bugatti type 57 #57525 (Est. 180 / 220.000 Euro), qui retient l'attention par sa beauté et son histoire. Au début des années 80, un collectionneur champenois l'acheta châssis nu à la succession du Président du Club Bugatti de l'époque, Alain Spitz (par ailleurs auteur d'un livre sur les Talbot), et il entreprit de l'habiller d'après un sublime dessin daté de 1939 dû au carrossier attitré de Bugatti, Gangloff à Colmar. Cette démarche, qui reçut l'aval du pape de l'automobile de collection Serge Pozzoli: " j'aurais fait la même chose ", obtint le prix de la passion au Louis Vuitton Classic à Bagatelle en 1990. 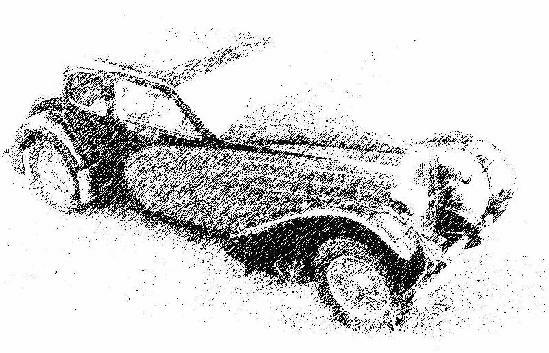 Par ailleurs son histoire fut abondamment commentée, dans Automobiles Classiques d'avril-mai 1991 sous la plume de Christian Descombes et Maurice Sauzay lui consacra un chapitre dans son livre " Fantastiques Bugatti " (EPA 1995).